Saint-Malo is a walled port city in the French region of Bretagne. The population is about 50,000 of the city itself though the total urban area has about 135,000 people. The Dinard – Pleurtuit – Saint-Malo Airport (DNR) has flights with Lydd Air to Lydd, with Aurigny Air Service to Guernsey and with Ryanair to London and East Midlands. The TGV (high-speed train) goes to Rennes, Paris and several regional destinations. 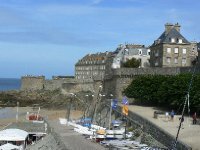 We have a comprehensive list of accommodation in Saint-Malo searchable right here on Travellerspoint. You can use our map to quickly compare budget, mid-range or top of the range accommodation in Saint-Malo and areas nearby. This is version 6. Last edited at 3:42 on Aug 2, 17 by sleepBot. 5 articles link to this page.